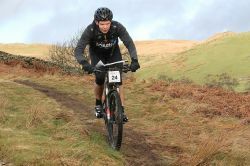 The 2019 Open5 race in the South Lakes was the biggest for many years, and over 200 competitors crammed into the Bryce Institute in the village of Burneside to register for a weekend of running, riding, navigating and strategy in the surrounding valleys and hills. The Open5’s have been going for 14 years now as a 5 race series, but 2019 is a new era as it will now be a one-off annual event. As a result the many faithful Open Adventure followers grabbed their chance for this year and turned up for a bigger event where they could meet up with racing friends made over the years. It was a tight fit into the hall, and a slightly theatrical setting beneath a curtained stage (recently used for Jack and The Beanstalk). From early morning racers registered and also collected their trackers, which was another innovation for this Open5. Their race packs contained the two course maps, one for running checkpoints and the other for riding, but they would not get the points values for each CP until they crossed the start line, and there were dummy CP’s on the map too. This resulted in lots of map speculation as they enjoyed tea, coffee and flapjack before the start, which is all a part of the sociable Open5 experience. There is plenty to think about as the score format for the race tests strategy to the full. Within the 5 hour time limit racers must run and ride, but how much of each they do is up them. And on each section the course and route they take are up them as well. Their aim is to get as many points from visiting CP’s as possible ... or just to go to the best bits of the course and have a great day out if they want. The start was 3 miles down the road in Staveley in a playing field on the edge of the village, and the first choice was whether to run first, or to ride. Then having been given the points values on the start line the second was to figure out where to go, how long it would take, and come up with a plan. In no time at all the competitors were scattering into the hills on a morning that was still misty and overcast after the previous day’s storm had blown through. There was plenty of evidence of this and the recent snow melt on the often flooded tracks and roads, and slippery, sodden hillsides, but the weather gods were kind and it soon turned into a fine, sunny winter’s day. Both courses had CP’s scattered either side of the Kentmere valley with 17 ride and 19 run options, and more points overall for those on the ride. One option on the ride was to take on the classic route over the Garburn Pass and opinions were divided on this. With only a lowly 5 point CP near the top some thought it not worth the effort. One of the highest run checkpoints was on Brunt Knott which has a 360 degree panorama but was a steep climb to reach and not the place to stop and check the map for too long. It might have been sunny but the winter wind was still chilling. As the 5 hours ticked away competitors came back into the finish, some relaxed as they were nice and early and others racing hard to the line as they were late and losing points. (Every minute late means hard won points lost!) James Thurlow of Open Adventure had advised newcomers to ‘not be greedy’ and the Parsons were back early on their tandem having pushed to get extra checkpoints in the past and then lost more points than they’d earned. “From experience we apply the rule - If in doubt leave it out.“ Corinne said. Almost everyone stayed for the prize giving, and some of the results were very close, but not all. Tom Gibbs was well ahead in the Male solo’s. When his total of 580 points was announced there was a murmur of approval and astonishment around the hall as he’d missed only two biking CP’s. In the female solo’s Jane McCarthy won with 425 points while Rosemary Byde and Lucy Spain were clear winners in the female pairs, despite losing 20 points for being late and missing a 30 point CP on the run in to the finish! The male pairs winners were Alex Pilkington and Michael Mason and the mixed pairs was won by David and Kim Spence. The full results, tracking and links to the event photos are all on the Open Adventure website and Facebook page. Rob is Editor of SleepMonsters.com. He's traveled the world reporting on and photographing adventure races and day-to-day he keeps his finger on the pulse of AR to ensure SleepMonsters is the heartbeat of the sport.